Okay, Coach. There are two days before the Huskers take the field for the first time in 2018. How are things looking? The Huskers play Akron on Saturday at 7 p.m. under the lights of Memorial Stadium. It’s a long wait to the season, and then it’ll be just as long a wait before they get to play. Athletic Director Bill Moos doesn’t like night games (his old rancher, early-riser personality poking through) but Frost has a plan to keep the players engaged. The team will get together in the morning to get moving, something “so their bodies are more prepared for the night,” Frost says. The afternoon belongs to the players. Go watch college football. They’ll meet back up in the evening when appropriate and get ready for the game. 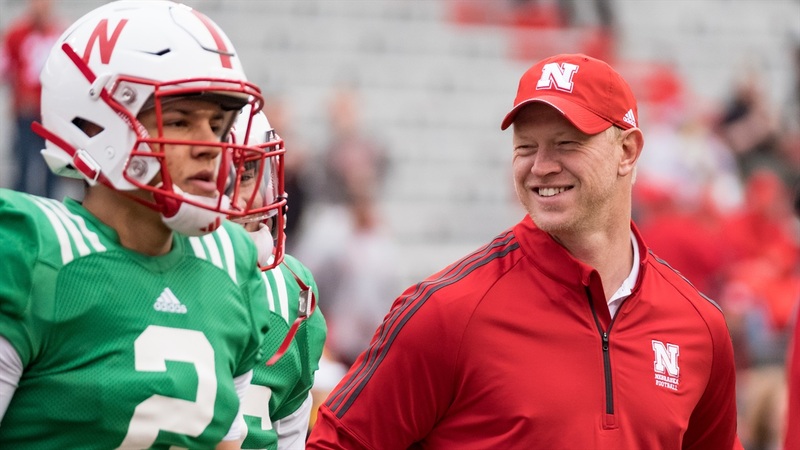 “Sometimes it’s a long wait when it’s a night game but night games in Memorial Stadium are pretty special to me,” Frost said. The Tunnel Walk will be different, and there’s not really any reason to not be excited to take the field for the first time. “If Husker Vision is doing their job,” Frost said, “I’m going to be jacked up. I don’t know how you can tell a guy running out there for the first time not to be.” But after that, Frost wants execution and precision. Akron presents its own set of challenges. The Zips played in the MAC Championship last season, return nine starters on defense and bring dual-threat quarterback Kato Nelson into the game. Frost says they’re a well-coached team, says there’s a reason they played for their league trophy last year. “You can tell by how disciplined their players are, they’re where they’re supposed to be, they know what they’re doing. I think they’ve got good talent, they play hard. All the signs of a good team,” he said. “We need to be able to match intensity and execution. If we do that, I think we’ve got a shot. >> The Huskers will don an alternate uniform once or twice in 2018. Moos just didn’t want to say what they’ll look like, but was able to confirm one would be worn when Nebraska faces Illinois on Nov. 10. >> Nebraska will be allowing hometown area codes on the front of player helmets this season. It was a move started by Frost at Central Florida — a well-received one at that — and a move that will be continued in Lincoln. >> There has been plenty of quarterback news over the last seven days, but the two guys now atop the Huskers’ depth chart have handled everything well. First, there’s walk-on sophomore Andrew Bunch. Bunch was No. 3 and out of the quarterback competition for the final stretch of it; now he’s No. 2. He said Wednesday his approach hasn’t changed but Frost sees a growing confidence within him. The other guy, the starter, true freshman Adrian Martinez, has a budding confidence as well. Frost said it’s natural when in the midst of a competition to be anxious about where you fall in the pecking order. It’s about how you respond when you learn you spot. Asked if he would scale back his aggressiveness in playcalling given the depth at the quarterback position, Frost said things might change if they’re in a blowout one way or the other but expect him to call what he needs to. >> The Huskers will “probably” go with rotating captains in 2018 rather than four permanent ones. >> Senior safety Aaron Williams was hampered in the spring, then he was non-contact throughout the start of fall camp. Since he’s come back to full-go, Frost has been pleased.